Today is Bak full moon; It marks Buddha’s second visit to the island for settling a dispute between two Naga kings -Chulodara and Mahodara. People of past generations believed in gazing the new moon, which appears 14 days before this day as a good omen. Homage paid by the Sinhala Buddhists to moon [nava sanda belima] in the present times though uninspiring and weak, seven centuries ago, a sightseer to Sigiriya marked his visit on its Mirror Wall with the above graffiti. In checking crime, rulers in ancient times, like the Governments today, used suppressive methods including punishment. The Cakkavatti Sihanada-sutta of the Digha-nikaya clearly states that poverty is the cause of crimes and immorality such as theft, violence, falsehood, cruelty and hatred. Another sutra in the same Nikaya, Kuṭadanta-sutta explains how ineffective this is. Buddha suggests that, in order to eliminate crime, the economic state of the people should be enhanced: Grain and subsidies for agriculture should be provided to farmers; and capital provided for those engaged in business; adequate wages to those who are employed. If people are provided for with prospects for earning a sufficient income, they will be pleased; with no fear or anxiety the country will be free from crime. The Buddha did not take life in isolation, out of the context of its social and economic environment; he took it as a whole, in all its social, economic and political aspects. His teachings on ethical, spiritual and philosophical problems are fairly well known. But little is known, particularly in the West, on his teaching on social, economic and political matters. Yet, there are numerous discourses dealing with these strewn throughout the ancient Buddhist chronicles. The Buddha told lay people how imperative it is to improve their economic condition. This does not mean that he permitted of amassing wealth with attachment and greed, which is in opposition to his fundamental training, nor did he approve of each and every way of making one’s occupation. There are certain operations like the production and sale of armaments, which he denounced as immoral means of livelihood, as we saw previously. Let us look at an example. Fourth: He should use up reasonably his expenses, in proportion to his returns— meaning he should live within his resources. Emperor Asoka of India (c 3rd BC) first followed the example of his ancestors and wished to continue the conquest of the Indian neck of land. He invaded and conquered adjoining lands killing hundreds of thousands. When he was converted to Buddhism, he was completely transformed by the teachings. The Buddha was just as clear on politics, on war and peace. It is too well known to be repeated here that Buddhism promotes and advocates peace as its widespread message, it disapproves violence or destruction of life. According to Buddhism there are no ‘just wars’ – a false term put into motion to justify and reason violence, hatred, cruelty, and slaughter. Who decides what is just or unjust? My war is always ‘just’, and yours is always ‘unjust’. Buddhism rejects this position. The utterances of attaining peace through the balance of power, or through threats is foolish. 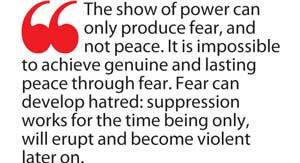 The show of power can only produce fear, and not peace. It is impossible to achieve genuine and lasting peace through fear. 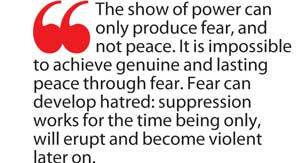 Fear can develop hatred: suppression works for the time being only, will erupt and become violent later on. True and genuine peace can prevail only through metta, amity; free from suspicion, fear, and danger. There were rulers who governed their states unjustly even in the days of the Buddha. People were exploited and oppressed, agonised and mistreated, excessive taxes were imposed and cruel penalties were imposed. The Buddha was deeply moved by these injustices. The Dhammapadaha Katha says that he directed his mind to the issue of good governance. He had revealed how a whole nation could become dishonest, corrupt, and discontented when the leaders of its government, the cabinet and administrative staff become corrupt and unreasonable. For a nation to be contented it must have just rulers. How this can be achieved he explained in Dasa-raja-Dhamma; the ‘Ten Duties of the King. Some believe that Buddhism is involved only in superior ideals, lofty moral and philosophical thinking, and that it pays no attention to the social and economic aspects of people. This is a wrong view. To Buddha, happiness was not achievable without leading a life based on moral and pious principles. But he understood that leading such a life was difficult in adverse material and social situations. Buddhism renounces struggle for power; rejects conquest and defeat; it denounces persecution of the innocent; respects those who conquer themselves more than those who conquer thousands by military warfare; profess conquer of hatred by kindness, and evil by goodness; promotes compassion as the driving force of action, where all living things are treated with fairness, consideration and love; peace and harmony in a world of material satisfaction—for the realization of the Ultimate Truth, Nibbāṇa. The chaplain replied: Your Majesty’s country is inundated by thieves, it is devastated, villages and towns are being shattered, and the countryside is infected with highway robbers and plunderers. If Your Majesty were to tax this nation, that would be the incorrect thing to do. You may think; ‘I will get rid of this pestilence of thieves by executions and detention, or by elimination and intimidation’, the plague would not be appropriately ended. This entry was posted on Wednesday, April 20th, 2016. You can follow any responses to this entry through the RSS 2.0 feed. You can skip to the end and leave a response.